Rigpa’s Spiritual Care Programme offers practical ways in which the which the compassion and wisdom of the Buddhist teachings can be of benefit to those facing illness or death and also to their families and medical caregivers. 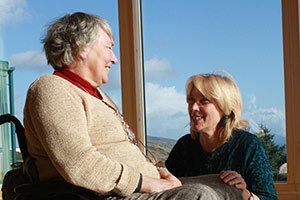 Since 1993, the Spiritual Care Education Programme has brought the compassionate methods described in The Tibetan Book of Living and Dying, by Sogyal Rinpoche, into training for professionals and volunteers who work in health and social care settings. The first Buddhist temple in Ireland is going to be built at Dzogchen Beara. The temple will be built in the style of a traditional Tibetan monastery, a form of architecture designed to be an inspiring symbol of the Buddha’s teachings. The projected completion date is October 2017. In a spirit of dialogue and exchange, these events bring together eminent Buddhist masters with leading doctors, scientists and historians from all over the world, to share the view of their respective traditions. The heart of Rigpé Yéshé’s vision is to offer children and teenagers an authentic spiritual path so that they can grow into wise, compassionate and happy young people who have confidence in their true nature, the courage to face the challenges of the modern world and who can be truly of benefit to others. In the East, Rigpa actively supports a number of monasteries, nunneries and study centres. Rigpa also supports individual masters and practitioners, as well as social programmes, in a concerted effort to help keep alive the great wisdom culture of Tibet. Additionally, Rigpa also sponsors an annual programme of practice intensives (drupchen) and prayer gatherings (mönlam), that are a unique feature of the Buddhist tradition of Tibet, and considered to be especially powerful for bringing peace in the world, harmony to the environment, and benefit to all living beings. The Rigpa Treasury of Wisdom project aims to preserve and make available a unique collection of teachings given by some of the most outstanding masters of the Tibetan Buddhist tradition. Since the 1970s, Rigpa and Sogyal Rinpoche have played a leading role in inviting some of the most eminent masters of the Tibetan Buddhist tradition to give teachings in the West, including His Holiness the Dalai Lama and the heads of the four schools of Tibetan Buddhism, and many of the most outstanding masters and lineage holders of our time. These teachers are amongst the first generation of great masters to introduce Tibetan Buddhism to the modern world, and the teachings they gave form an historic and priceless treasure.